It will smell, look and even taste like regular satay, but it will not be chicken or beef on a stick. Instead, it will be a dish based 100 per cent on plant-protein. The vegetarian satay is one of the products that could emerge from the new WIL@NUSCorporate Laboratory, which aims to drive innovation in food technology and sustainable biochemicals. 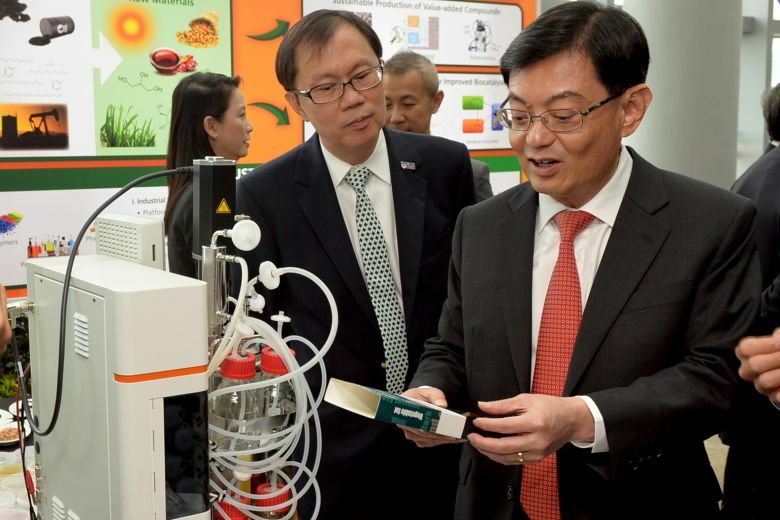 The $110 million research facility, which is jointly set up by Wilmar International, National University of Singapore (NUS) and the National Research Foundation, was launched yesterday by Finance Minister Heng Swee Keat, who is also chairman of the foundation. Wilmar is the world’s largest manufacturer of oleo-chemicals, used in the production of everyday consumer items like industrial cleaners, lubricants and fragrance. The 2,000 sq m joint research lab will comprise of two key clusters. The first will look to address major public health issues through the development of healthier foods, like the plant-based satay. The other cluster will look at designing cost-effective and sustainable methods of producing chemical compounds using natural sources. Currently, plant-based feedstock is used for the production of high-value oleo-chemicals. Scientists at the lab will look to produce biochemicals from natural sources with the use of microbes and enzymes. Researchers at the WIL@NUS Corporate Laboratory will also look at ways to formulate healthier cooking oils that could reduce cholesterol levels and in turn lower the risk of chronic diseases. They will also develop food products such as ready-to-eat meals and beverages that could help to manage diabetes and obesity. Wilmar chairman and chief executive officer Kuok Khoon Hong said that his Singapore-based company was thrilled to be embarking on the collaboration with NUS . He added that the food industry was experiencing a paradigm shift. Mr Heng added that he looked forward to food products from the lab that could enhance people’s health and well-being, as well as to greener and more sustainable production of biochemical compounds for the industry .